Bass (Baz) L. Outlaw (1854-1894) – Born in 1854, exact date unknown, and coming from a good family in Georgia, Bass grew up to be a refined gentleman, but he had a serious drinking problem that continually got him into trouble. 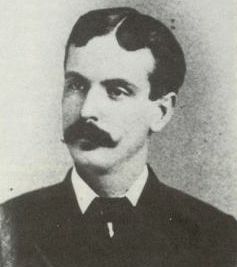 After he allegedly killed a man in Georgia around 1884, Bass, also known as Baz, fled to Texas where he became a Texas Ranger. He was soon promoted to a sergeant but, when discovered drunk on duty in Alpine, Texas, he was dismissed. Later, he obtained an appointment as a U.S. Deputy Marshal but was continually reprimanded for drinking. In 1889, while Baz, along with U.S. Deputy Marshals John Hughes and Walter Durbin, were guarding bullion shipments from a silver mine in Mexico, a drunken Baz fought with a Mexican worker and shot him. That same year, Baz, along with fellow U.S. Deputy Marshals, John Hughes and Ira Aten, and Deputy Sheriff Will Terry, planned an ambush near Vance, Texas on the fugitive Odle brothers. Before the night was over, Outlaw shot down both Will and Alvin Odle.